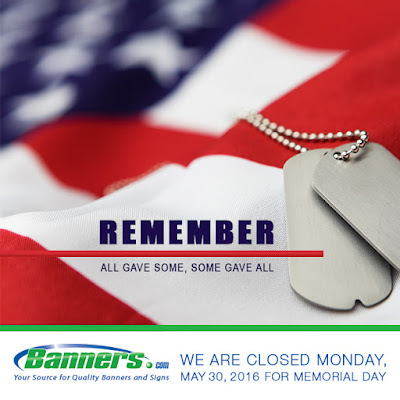 Our offices and production facilities will be closed on Monday, May 30th in Honor of Memorial Day. This means that Monday will not count as a production time for your banners and signs. If you have any questions about your order, please contact your customer service representative. Thank you to all past and present military for your service. We hope that everyone has a safe Memorial Day Weekend. We will resume our normal business hours on Tuesday, May 31st.